What better way to be stunning and snug than with a handwoven wrap or scarf from India? 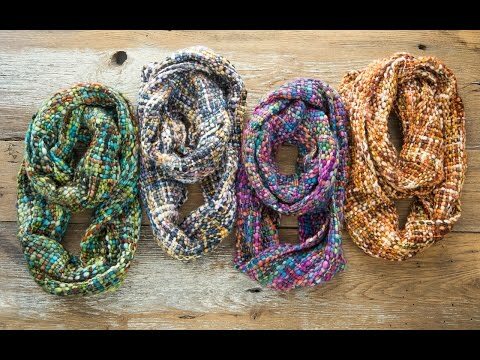 Rising Tide’s chunky woven infinity scarves and ruanas are crafted by hand in beautiful palettes with strands of varying lengths. Soft and versatile, their textured look makes a gorgeous statement piece that’s functional, too. In bold colors, Rising Tide’s infinity scarves add a bright accent to fall and winter neutrals. 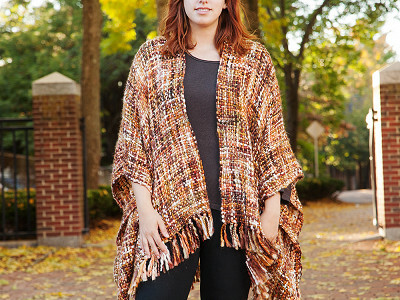 And their ruanas—a take on a traditional type of poncho from the Andes Mountains—feature soft, watercolor hues. The ruanas are like an oversized wrap with a slit and two longer pieces that you can drape in different ways. Rising Tide was founded in 1989 with a mission to bring high-quality goods to the USA from developing countries. Through these partnerships, artisans from poor areas can improve their living standards. Whether you’re walking the dog in the park or heading to the office in the cool weather, look trendy and stay warm with these super-soft, cozy knits. Hello! My name is Raisa from Rising Tide, and I am very excited to answer your questions about our Chunky Knit Infinity Scarves as well as our Chunky Knit Ruanas! I work on the design team at Rising Tide and work closely with the founders of the company, Jeff Shotland and Pete Sylvan. Hi Raisa? Are these machine washable and would they shrink? They are not machine-washable, we recommend dry cleaning! What type of fabric is used? Wool? Cotton? Blend? Thanks for your question, the fabric content is 100% Recycled Acrylic. Hi Raisa! These scarves are lovely, but I think your description is a little inaccurate. They do not appear to be knits... their construction seems to strictly be woven... no knitting involved. Is this correct? Great question, You are correct there is NO knitting involved, they are in fact handwoven on wooden looms. We have adopted the "Chunky Knit" description, as do many other makers, to convey the feel and texture of the scarf while using the on trend language of the season. A more accurate description would be "Chunky Woven." Thanks for pointing that out! I recommend Rising Tide clean up their copy and the Grommet Team get a better spokesperson (or train Erica to drop the "Valley girl" affectation), and you'll likely sell a lot more of these beautiful products. The scarves are in fact Handwoven. Sorry for the confusion. Hi Guest, thanks for the comment. Raisa has mentioned multiple times on here that "chunky knit" was a description to convey the texture and feel of the scarves as have many in the fashion industry. In regards to your comment about our video. We source the help of our entire Grommet team to film our videos. We are not a team of spokespeople, which I, and many, feel contributes to the authenticity of what we are trying to do here. We appreciate feedback in regards to the product when it is constructive, but personally attacking someone's voice, especially a Grommet team member, is not even close to constructive feedback. Erica did a great job with the video and had the courage to put herself out there to talk about this beautiful product which is far more than I can say for someone cloaking themselves in anonymity on the Internet. @Mike Bravo!! Well stated! The majority of us are here because we CHOOSE to be. I head the video team here at The Grommet and I just want to say, Erica did a wonderful job presenting this video. As Mike explained, we do not hire professional actors to narrate our videos. We are simply real people telling real stories and Erica's sense of style made her a perfect fit for such a beautiful apparel item. These items are woven, not knitted. Loom-created. Why are you calling them "knits"? As a professional textile artist who weave, knits and crochets the garments and other items I create, I'm often puzzled as to why some manufacturers conflate the various methods of production. Thanks Denise and Joya, I was about to raise the same issue. Textiles are either woven or knit but not both. These appear to be woven. @Elizabeth @Denise You are all absolutely right, sorry the description is misleading. We have been using it for a few years now and like I said above it keeps our product current with language used in the fashion industry. I really appreciate you all bringing this up, I was waiting for it! I've been in the business for over four decades and scratch my head at the recent trend in the "fashion industry" to call woven items "knits." It's inaccurate and, in my opinion, deliberately misleading. A knitted textile has different drape and elasticity compared to a woven one. Plus, I think it perpetuates what has often been confusion among the general public about the differences in the methods and functionality of each type of fabric. Thanks again and for the chance to state my thoughts. I think these items are lovely. Thanks Denise, I understand your concerns. I appreciate you bringing it up here on the Grommet! We are a small part of a very large and growing industry and sometimes a little thing like product description, helps us keep up! I'm really happy you like them and again, thanks for voicing your valid and insightful points. @Denise One of the ways we gauge the versatility and appeal of a potential Grommet is to have samples in the office and hear the reactions from both visitors and team members. I can tell you that the Ruanas were constantly travelling from one person to another--always in demand and they made just about every outfit special. I was guilty of harboring one in my own office and was reluctant to give it up for photography! 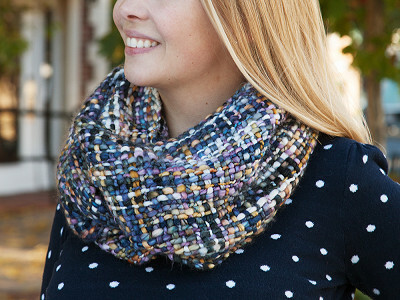 Any chance you'll offer the Ruana in the lovely lavenders/blues/greens of the infinity scarf? I love those colors. Isn't it pretty? You should inform the Grommet to carry the purple color way on their site! Hi Raisa, the infinity scarf only shows it worn around the neck. Can it be worn to cover the head and ears like a hoodie? Also you should ask the Grommet to carry the Hooded Infinity of this style. Hi Raisa. Is there a showing of the various colors available? Can buyers suggest or request certain color combos? Unfortunately we do not do custom color combos :( The Grommet has 4 colors in the infinity and 2 in the ruana. You should ask The Grommet to carry more colors! Thanks for your inquiry though! As a person who has created a lot of textiles your description is confusing. Knitting and weaving are two very different processes. The scarves look woven to me. 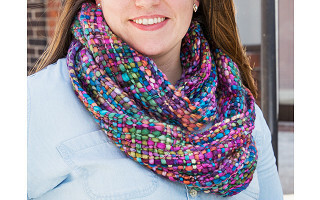 What color is the Chunky Infinity Scarf that is on the model on this page? It looks to have a rainbow of colors but I don't see any color description similar to it on the "Buy" page. @Jan That would be "purple." 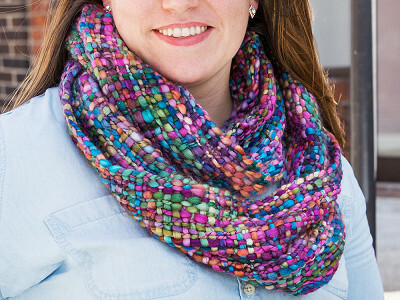 The shot on the model (who is really Ali, one of our team members who co-manages the site operations at Grommet) is closer to the actual color than the SKU shot of the scarf on the white background. I.e. it is brighter than the white background shot seems to be.